The CSV import tool allows to you create & update existing objects from a CSV file. Various settings can be made regarding how existing objects are matched and how CSV columns are applied. The CSV preview grid shows the first 20 CSV rows. Click the Search icon to verify your settings and to see a preview of the changes that would happen. The column configuration defines how CSV columns are mapped to object properties. Objects can be looked up in different ways. Your CSV export might have a filename column so you decide to match via the filename. There are different resolver strategies available. The simplest one is the ID strategy which expects that a column value matches exactly with a object ID. In some cases you might want to implement your own strategy. The Code Resolver allows you to do this. Give a short overview about the auto-detected CSV dialect. Allows you to describe your configuration. A configuration can be saved and reused at a later time. Moreover, a saved configuration can be shared with other users or roles. For admins it is also possible to share the configuration globally. Note that you will still be owner. 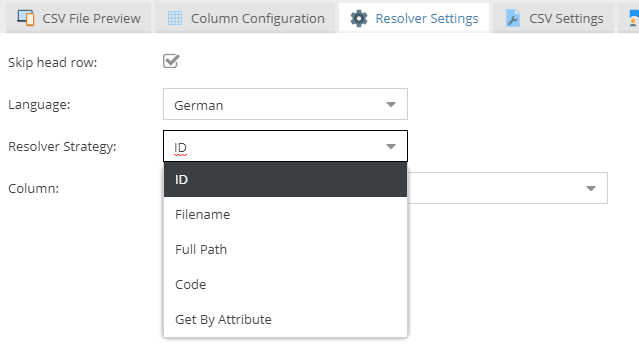 Load a export configuration and create a rudimentary import configuration. Please note that a complete import configuration cannot be automatically generated on the fly. But there are at least certain basic options that can be automatically set. You can use the events described in the Events section to hook into the import process.